Fig Leaf Software Blog: CommonSpot Custom Field Craziness! 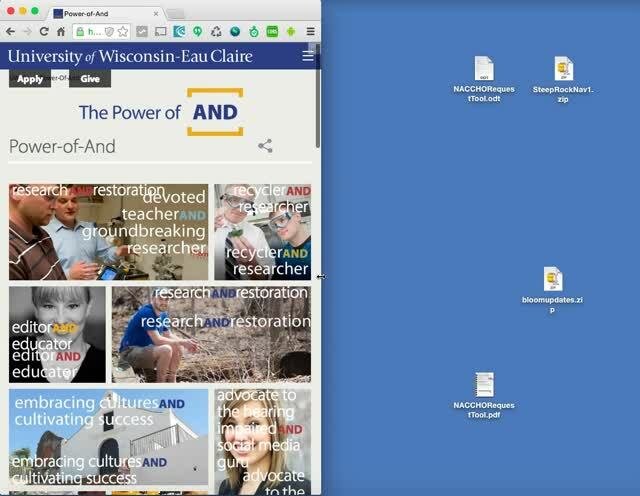 We were recently tasked by the University of Wisconsin, Eau-Claire to produce a series of advanced custom elements to help their content contributors generate a Pinterest-style image grid. An image editor that allows contributors to upload an image and then pan/zoom/crop to a specific image size. An editor that allows contributors to overlay caption on top of the cropped image. Starting from a codebase with limited pan/zoom cropping functionality (http://danielhellier.com/imagecrop/), we refactored the jQuery component to support fixed-sized crop areas as well as implement a bounding box and also tied in a slider component to enable easy-to-use zooming. We also added in the capability to transmit the scaling/cropping coordinates to an application server for server-side processing. For this project, we needed to give contributors the ability to place a text overlay on the image. The word “and” would need to be automatically converted to uppercase and have a style applied via CSS. To enable the users to choose a color, we used the spectrum plugin for jQuery which generally worked as advertised. Leveraging the jQuery isotope and jQuery lazyload plugins, Fig Leaf’s developers were able to devise an algorithm that would automatically resize images into a “pinterest”-style image grid in order to minimize the right margin space that typically results from implementing these types of layouts as well as work with the dyanamic text overlays required by the customer. [You can view an early proof-of- concept by clicking here]. Contact Fig Leaf Software’s Professional Services group at info@figleaf.com to discover how we can help you achieve your CMS implementation goals.